Pappu maimdikaya(mango dal recipe) recipe is very popular in Andhra Pradesh especially in summer. Because delicious raw mangoes are available during summer. The combination of raw mango pieces and toor daal will give you sour and tingling taste to the daal. When I have cooked this pappu mamidakulu(mango dal) recipe for my friends, those are Maharashtrains and north indians, they became huge fans to this recipe.. Now, it becomes a routine menu in their families. That’s the impression it created. So, finally summer has arrived. I am eagerly waiting to prepare this recipe. To prepare this recipe, use sour mangoes only. Don’t use sweet mangoes those don’t go well with daal. We can also prepare wide varieties by using mangoes like mamidikaya bendakaya (mango bendi) curry, mamidikaya vankaya(mango brinjal) curry, mamidikaya pulusu etc. Different chutney’s are also there like mamidukaya pachadi (mango chutney), mamidikaya kobbari pachadi(mango coconut chutney) etc. sweets like mango halwa, mango burfi etc. 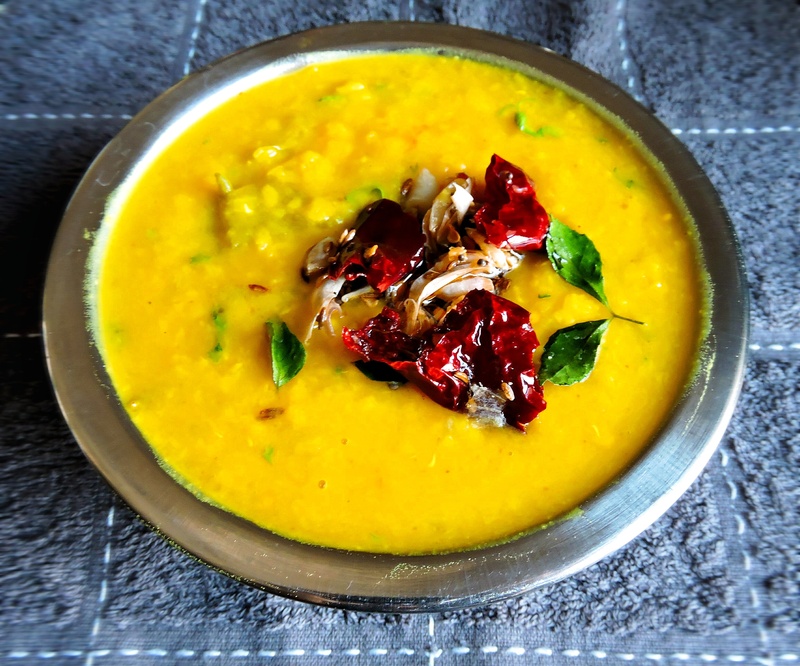 To prepare this pappu mamidakulu(raw mango dal) recipe we use raw Mango, toor daal, onions and green chillies. We enhance the taste by adding tadka at the end. I prepare this recipe in pressure cooker because daal takes little extra time to cook. If you don’t have pressure cooker then you can use regular curry pan. For more veg recipes go to different veg recipes with simple procedures. Raw Mango: 1, skin peeled and chopped in medium size. In a pressure cooker add washed toor daal, raw mangoes pieces, sliced onions and green chillies, turmeric powder and 3 cups of water then close the lid and wait 4-5 whistles. When the complete pressure goes out, open the lid and add salt. Mix properly, set a side. In a tadka pan, add 1 table spoon of oil. Oil once becomes hot add crushed garlic cloves, mustard seeds, cumin seeds, red chillies, hing and saute for a while. Later add curry leaves stir a little. Finally add coriander leaves and give a nice stir and turn off the stove. Pour this tadka to the above cooked daal. Delicious mango daal is ready to serve.. It goes very well with rice..You can also have with roti.. If using very sour mango then use half portion of it. Because if you use full sour mango then recipe is leads very sour taste. If you medium or less sour mango you can add full mango. Adjust according to your taste. Use Green chillies according to your taste. If you love spicey then you can add more chillies. If you are preparing daal in curry pan then add more water(3/4 cups) while cooking. Because daal requires more water to cook. Delicious mango dal is ready serve. Serve with hot rice or roti.